The constellation Horologium. Roll mouse over to see labels. Horologium is a small southern constellation which culminates at around midnight in November. The name ‘Horologium’ is Latin for ‘clock’, and the constellation is usually depicted as a pendulum clock. The name was assigned to this sky area by Nicolas Louis de Lacaille in 1756. 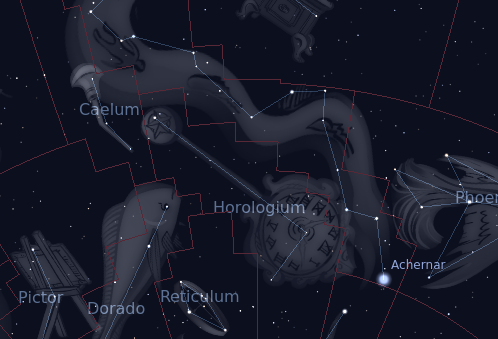 Horologium has only two stars brighter than fifth magnitude, but does have a few deep sky objects of interest, including the globular cluster NGC 1261 and the barred spiral galaxy NGC 1512. A very much more challenging cluster is Arp-Madore 1, the most distant known globular cluster in orbit around the Milky Way. 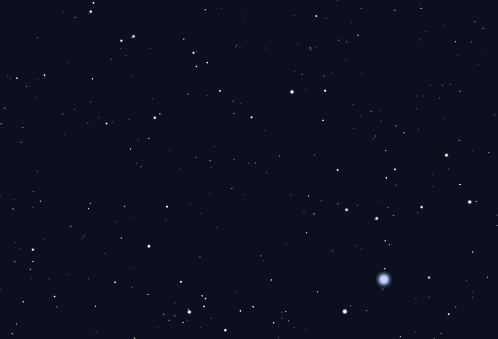 However, at magnitude 16, a large telescope is needed to see it. Horologium contains the following Caldwell object: C87. The following constellations neighbor Horologium: Caelum, Dorado, Eridanus, Hydrus, Reticulum.